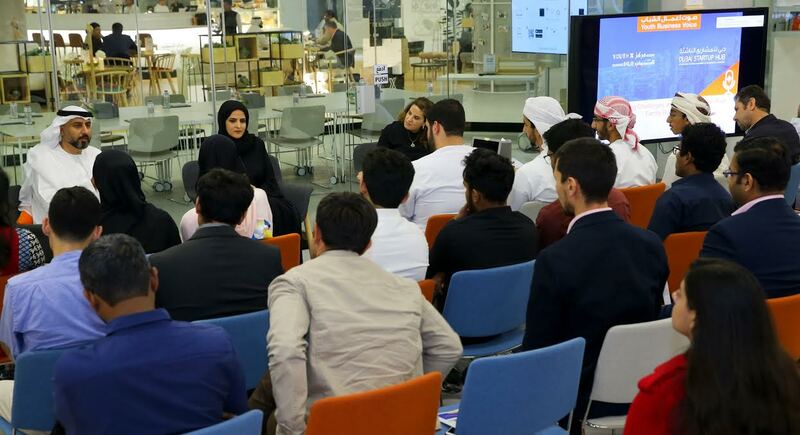 Dubai Startup Hub hosted the second session of its Youth Business Voice event series on January 17, 2018 at the Youth Hub in Emirates Towers. The event series, held in partnership with Emirates Youth Council, aims to nurture the growth of young entrepreneurs in the UAE and broaden their business know-how. This edition of Youth Business Voice revolved around the topic of family businesses, and how one can operate and grow within one. Alia Al Mazrouei, Chief Operating Officer, Mazrui International, and Khaled Al Fahim, Board Director, Al Fahim Group, were the guest speakers for the discussion, which was moderated by Sulaf Saleh Al-Zu’bi. Dubai Startup Hub will be hosting more Youth Business Voice events over the course of the year; stay tuned to @DubaiStartupHub on Twitter and Instagram to learn about the next edition of the event series.